Be gentle, this is my first written pattern… it also has not been tested by anyone but me, so there is a chance directions may make sense to me but nobody else. 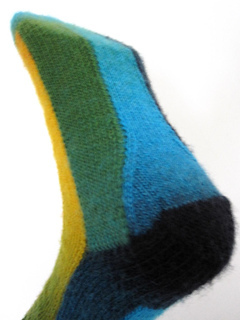 This sock has been designed to alter / play with the repeat in self striping or gradiation yarns. 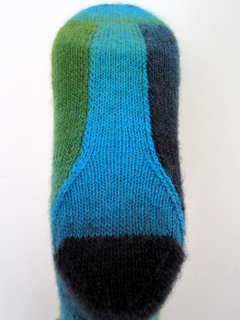 Most of the knitting will be done flat in stocking stitch, but the strips are joined through the knitting, so there is no actual sewing involved. Note of caution: Do not attempt this if you do not like picking up stitches, because there’ll be a lot of that. 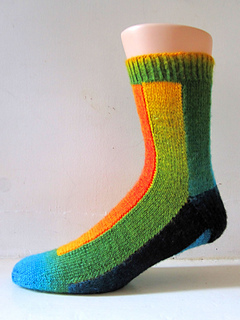 This pattern assumes that you have knitted socks before. 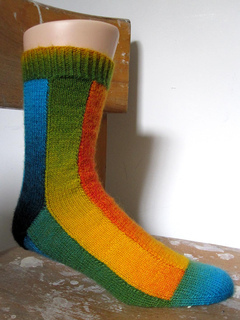 It will be easiest to follow if you know the dimensions of a plain sock that will fit you well. 10 July 2011: Since people have asked for clarification, I have posted two more pictures that show the sole in more detail. Please feel free to ask if you need more info ! 05 March 2015: The pattern layout has been tweaked, and I have finally included in structions for a single piece sole. 07 May 2015: I managed to omit a whole paragraph in the March update, sorry about the confusion. Should all be ok now.